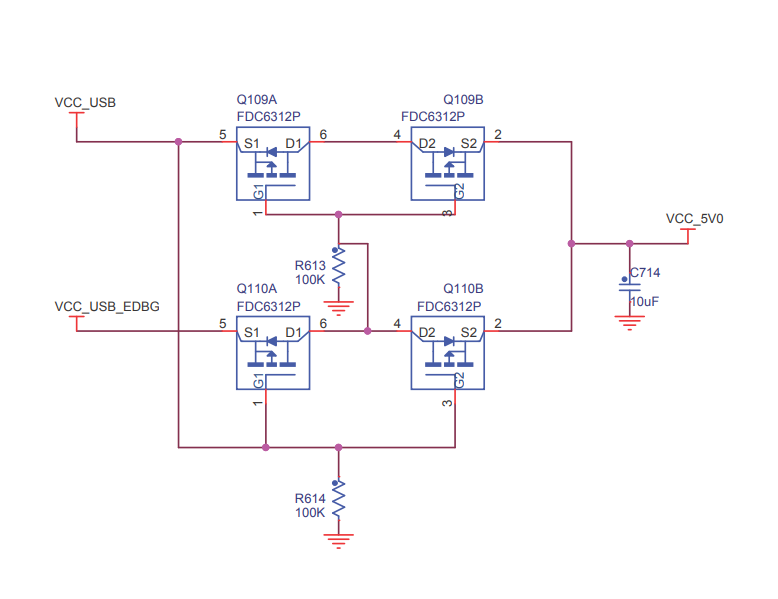 I'm working on a project that operates at 5v - and can draw UP to 10 amps. Under normal conditions, it won't be doing that - probably closer to 3 amps, and (if configured for low-power) only 450mA or so. It's designed to be powered from USB when in low-power mode, but I also want to have 2 barrel jack to add external power supplies (5V, 8A from aliexpress). Obviously I don't want the power supply backfeeding the USB, or the USB backfeeding the power supply. I want the option to plug in two of these power supplies because most of the time, I won't need to activate the 10A mode - so just one power supply would be sufficient. Considering these power supplies are not designed to be paralleled (no master/slave setup, etc), how effective would an ideal diode be in enabling these various sources to all operate in parallel (to increase max current)? Note that I don't need the load sharing to be perfect, but I'd like to avoid serious issues. I originally thought I could just use a P-Channel MOSFET, but after some research have learned that when they are "on" they allow current to flow both ways, which makes them non-ideal non-diodes (less than helpful). The VCC_USB input is dominant if both are present (in other words, if only one supply is present, that one will be used, if both are present, then VCC_USB is used). The back-to-back MOSFETs are "ON" when the common gate connection is at ground (assuming the left source is high) and are off with the gate connection equal in voltage to the source. Because of the intrinsic body diodes you need two MOSFETs to be able to block in either direction. This is the common configuration you'll see in hot-swap controllers and similar devices. The connection to R613 turns Q109A/B on if VCC_USB_EDBG is low. If both supplies are present Q110A/B are off (because their gates are high) and Q109A/B are on. Not the answer you're looking for? Browse other questions tagged power-supply mosfet current diodes parallel or ask your own question. How do current ratings on barrel connectors work? Using a barrel jack with higher than rated current but lower voltage? Can I use 2 Power Supplies in series like this?